An optimized blend of a thermostable DNA ligase and a proprietary additive, HiFi Taq DNA Ligase efficiently seals nicks in DNA with unmatched fidelity. Exhibits increased discrimination between correct and mismatched base pairs at either side of ligation junctions, making the enzyme suitable for the detection of either 3 ́ or 5 ́ mismatches (vs. other thermostable ligases which are efficient for 3 ́ mismatches only). An optimized blend of a thermostable DNA Ligase and a proprietary additive, HiFi Taq DNA Ligase efficiently seals nicks in DNA with unmatched high fidelity. The formation of a phosphodiester bond between juxtaposed 5´ phosphate and 3´ hydroxyl termini of two adjacent oligonucleotides that are hybridized to a complementary target DNA is enhanced in the improved reaction buffer and mismatch ligation is dramatically reduced (1). The improved formulation allows higher resolution discrimination between ligation donors and acceptors, enabling precise detection of SNPs and other allele variants. HiFi Taq DNA Ligase is active at elevated temperatures (37–75°C) (2,3). Please note that HiFi Taq DNA Ligase is intended for use in molecular diagnostics applications that depend on high fidelity nick ligation. It is not a substitute for T4 DNA ligase and is not suitable for cloning applications or adapter ligation/NGS library prep. (A) Schematic of multiplexed substrate pools. Each substrate pool contained a single splint with a defined NN at the ligation junction (e.g., AA, AC, AG…) along with all four upstream probes and all four FAM-labeled downstream probes. Each probe that encodes the base at the ligation junction is of unique length allowing for separation and analysis by capillary electrophoresis. A total of 16 substrate pools were prepared, one for each unique splint. 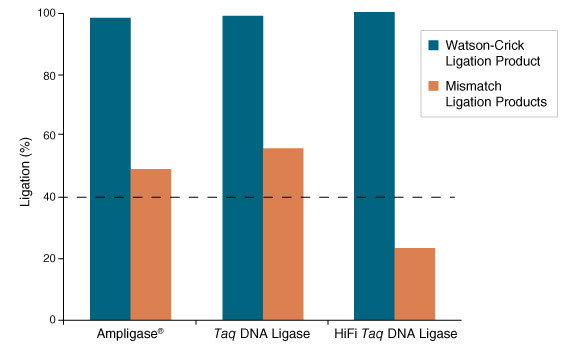 (B) Comparison of the ligation fidelity of Ampligase (Epicentre), Taq DNA Ligase and HiFi Taq DNA Ligase. Fidelity measurements were performed using 1 μl of ligase in a 50 μl reaction mixture in the supplied buffers at 1X concentration. Reactions were incubated 30 min at 55°C, using multiplexed substrate pools as outlined in (A). Rows represent a single template sequence, while columns indicate a particular ligation product resulting from a specific pair of probes ligating with the indicated bases at the ligation junction. A dot indicates detection of a product (see legend above). The diagonal from the top left to the bottom right represents Watson-Crick ligation products; all other spaces indicate mismatch ligation products. 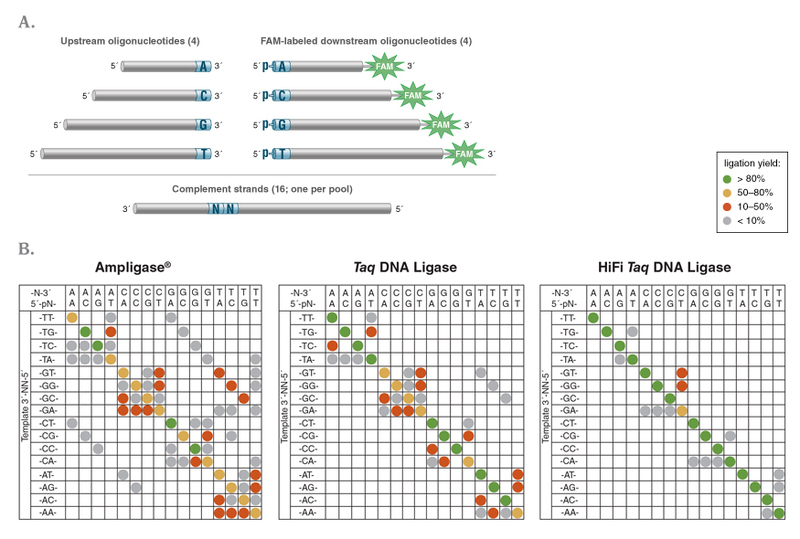 While Taq DNA Ligase and Ampligase perform similarly under these conditions, with a range of mismatch products detectable, HiFi Taq DNA Ligase shows dramatically fewer mismatch products while maintaining high yields (image adapted from Reference 1). Oligonucleotide probes targeting a 35 bp region of the λ integrase gene were incubated with 16.7 fmol of λ genomic DNA. Ligation products formed were detected by qPCR using SYBR® Green. 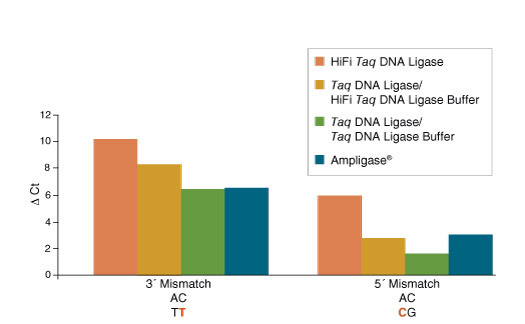 HiFi Taq DNA Ligase (NEB #M0647) displays increased fidelity over Taq DNA Ligase (NEB #M0208) and Ampligase, showing a larger ΔCt value between probes fully complementary to the target sequence and those with a mismatched base pair at the ligation junction. 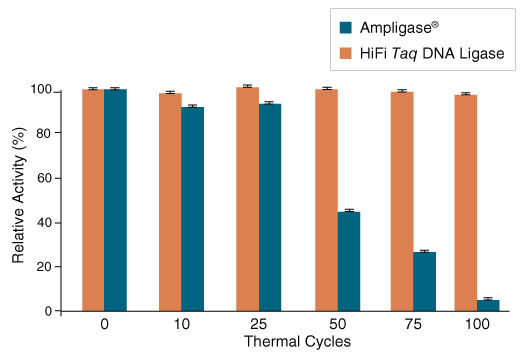 HiFi Taq DNA Ligase and Ampligase® (1 µl enzyme in a 50 µl reaction) were cycled (80°C for 90 seconds/94°C for 10 seconds) up to 100 times in their respective 1X reaction buffer. Ligase activity was assayed using a FAM-labeled nicked dsDNA substrate detected by capillary electrophoresis. The C:G Watson-Crick base pair between the upstream probe 3´-terminal base and the complementary strand makes this a particularly difficult junction for a ligase to discriminate against mismatch ligation products (1). Purified from an E. coli strain that carries the cloned ligase gene from a hyperthermophilic organism. Allele-specific gene detection using ligase-dependent methods including the Ligase Detection Reaction (LDR) and Ligase Chain Reaction (LCR) (2,4). Ligation of padlock probes (5). Reaction Conditions: Reactions with HiFi Taq DNA Ligase should be performed between 37–75°C. The optimal ligation incubation temperature for a given set of probes is typically within 5°C of the Tm of the probes annealing region and must be determined empirically for the best balance of activity and fidelity in your application. Use of the Thermostable Ligase Reaction Temp Calculator is highly recommended for selection of an incubation temperature. For a typical LDR-type assay, reaction time should be in the range of 10–60 minutes, with 15 minutes being ideal for many applications. For assays requiring denaturation/annealing/ligation cycling, we suggest denaturation @ 95°C for 30 s – 1 min, followed by annealing/ligation for 1 – 5 min at the optimized ligation temperature for your probe set. 1X HiFi Taq DNA Ligase Reaction Buffer requires NAD+ as a cofactor. NAD+ is supplied in the 10X HiFi Taq DNA Ligase Reaction Buffer. While 10X HiFi Taq DNA Ligase Buffer is stable at -20°C for 3 years, the buffer should be stored at -80°C to further extend the half-life of the NAD+ cofactor. 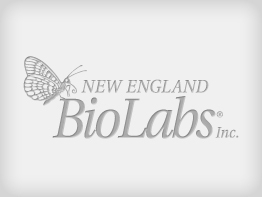 To dilute HiFi Taq DNA Ligase that will subsequently be stored at -20°C, 50% glycerol storage buffer (Diluent Buffer A, NEB #B8001) can be used, however, the shelf life of HiFi Taq DNA Ligase diluted in this buffer will be reduced. To dilute for immediate use, 1X HiFi Taq DNA Ligase Reaction Buffer can be used. 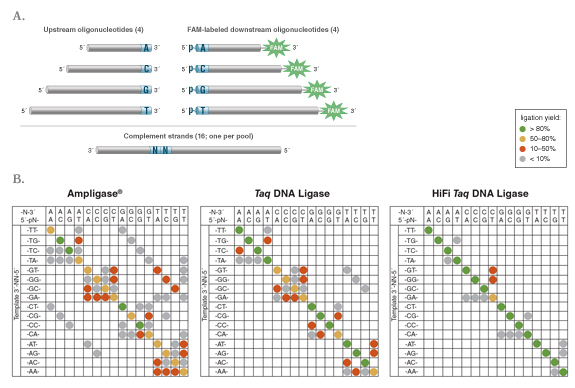 In order to achieve the highest fidelity possible with HiFi Taq DNA Ligase, we recommend using HiFi Taq DNA Ligase Reaction Buffer, however, HiFi Taq DNA Ligase can be used in Taq DNA Ligase Reaction Buffer with reduced activity and fidelity. Conversely, the use of standard Taq DNA Ligase in HiFi Taq DNA Ligase Reaction Buffer will boost the fidelity of that enzyme. HiFi Taq DNA Ligase can be used in a variety of polymerase buffers when supplemented with 1 mM NAD with reduced activity and modestly reduced fidelity. When visualizing ligation reactions by gel, some DNA sequences may exhibit a gel shift due to binding of protein components. This protein binding does not interfere with most downstream methods including amplification. We recommend pre-treatment with Proteinase K (1 μl in a typical 50 μl ligation reaction) for 30 min at 37°C before loading on a gel to remove this shift. The molar concentration of the ligase is 44 nM. Lohman, G. et al. (2016). Nucleic Acids Res. Barany, F. (1991). Proc. Natl. Acad. Sci. USA. 88, 189-193. Takahashi, M. et al. (1984). J. Biol. Chem. 259, 10041-10047. Barany, F. (1991). The Ligase Chain Reaction in a PCR World. 5-16. Nilsson, M., H. Malmgren, M. Samiotaki, M. Kwiatkowski, B. P. Chowdhary and U. Landegren (1994). Padlock probes: circularizing oligonucleotides for localized DNA detection.. Science. 265(5181), 2085-2088. What applications are HiFi Taq DNA Ligase best used for? Can HiFi Taq DNA Ligase buffer be used with other DNA ligases? Can HiFi Taq DNA Ligase be used in other buffers? What is the optimal reaction temperature for HiFi Taq DNA Ligase? How much HiFi Taq DNA Ligase is required for a reaction? How many temperature cycles will HiFi Taq DNA Ligase survive? Can HiFi Taq DNA Ligase be used for cloning? Does HiFi Taq DNA Ligase require NAD+? What is the stability of HiFi Taq DNA Ligase at 95°C? What is the stability of HiFi Taq DNA Ligase at room temperature? Why is the HiFi Taq DNA Ligase Buffer brown? Does HiFi Taq DNA Ligase have activity on substrates containing RNA?